Almost everyone reluctantly adorns a red and itchy eye at least once in a lifetime. While it may give you an edge over others if it’s Halloween, on most days it will just make you miserable. Itchy eyes are usually a result of an allergic reaction to something and accompanied by pain, swelling and a lot of discomforts. (1) However, itchy eyes can occur for other reasons, too. In most cases, it’s a problem that can be treated at home with simple ingredients. Read on to learn the causes and symptoms of the condition along with the remedies to help you get rid of itchy eyes. Allergies to pollen, pet dander or mold. Sensitivity or allergies to certain cosmetic products. Asthma, allergic rhinitis and eczema. 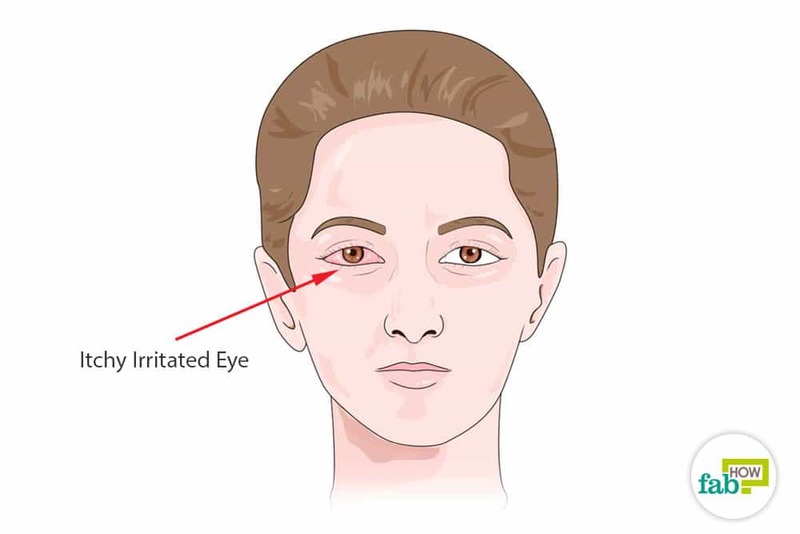 Inflammation around the eyelids referred to as blepharitis. Eye fatigue due to prolonged exposure to digital devices or bright lights, reading in dim light or lack of sleep. Warm climate and dry air. If you are already suffering from itchy eyes, avoid touching or rubbing your eyes at any cost. It not only aggravates the already irritated skin, but dirty hands can also contaminate your eyes, making the situation worse. Keep your home clean to avoid allergens. Wear your sunglasses when heading out in the sun. Avoid continuous exposure to electronic devices. Maintain good hygiene if you wear contact lenses. If your eyes are already red and itchy, avoid wearing them until your eyes get better. Try to stay indoors and keep your doors and windows closed during the pollen season. Change and wash your bed linens regularly. Use a wet mop to clean your home instead of a broom. Use a humidifier to maintain humidity in your home at 50 percent. Avoid sharing your bed with your pets, if the itchy eyes are an allergic reaction to pet dander. Also, avoid petting them until the symptoms subside. Wear swim goggles while swimming to protect your eyes from bacteria and other microorganisms. Wash your hands frequently when spending time in public places. It is important to consult your doctor to ascertain the cause of your itchy eyes before treating them. If it is not an infection, certain home remedies can help you get rid of the problem. Note: When using any home remedy, ensure that the utensils being used are well sanitized to avoid any contamination reaching your eyes. A cold spoon is a convenient utensil to serve as a cold compress. You can also use ice wrapped in a clean cloth or frozen peas or vegetables wrapped in a thin towel. A gel ice pack made with rubbing alcohol can also be used as a cold compress. Dip 2 spoons in ice water. 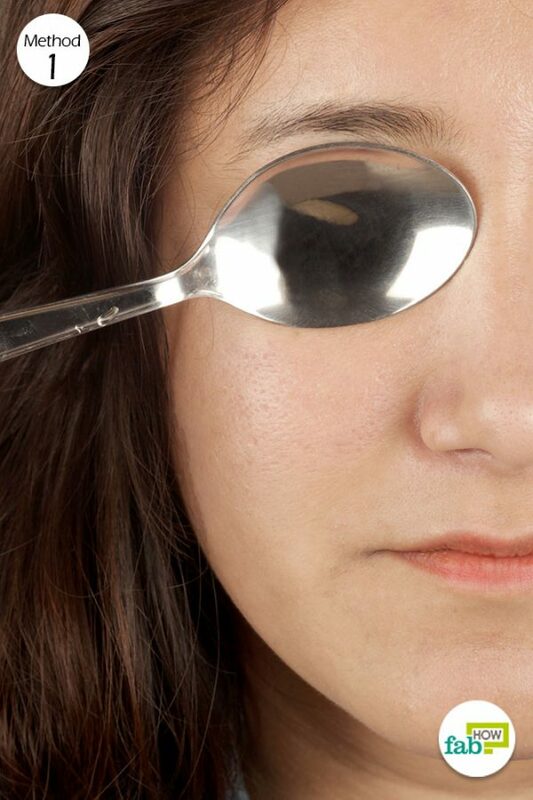 When chilled, place the back of a spoon on each eye and hold them in place for a few minutes. Replace the spoons with fresh cold ones as they get warm. Repeat 3 times a day for 2 to 3 days to reduce itching and redness in the eyes. Cold compress provides immediate relief in swelling and puffiness. Dab a cotton ball in some cold milk. Gently swab the cotton ball around your eye area. 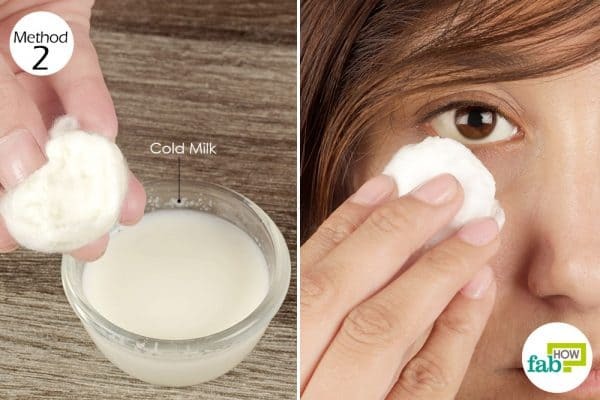 You can also place milk-soaked cotton balls on your eyelids for 15 to 20 minutes as a compress. Repeat 2 or 3 times a day to get quick relief in itchy eyes. If you regularly suffer from itchy eyes during the pollen season, use the cold milk remedy every morning and night to prevent the discomfort. Green or black tea bags can also be used as a compress to treat itchy eyes. (4) The tannins present in tea have astringent properties that help reduce the puffiness. Tea is also rich in flavonoids – antioxidants that help with inflammation, fight bacterial and viral infections in the eye. The cooling effect and astringent properties will provide immediate relief from the irritation. Moisten tea bags with cold water. Alternatively, you can put used tea bags in your freezer for 5 to 10 minutes. Make sure you keep them in a clean container inside the freezer. 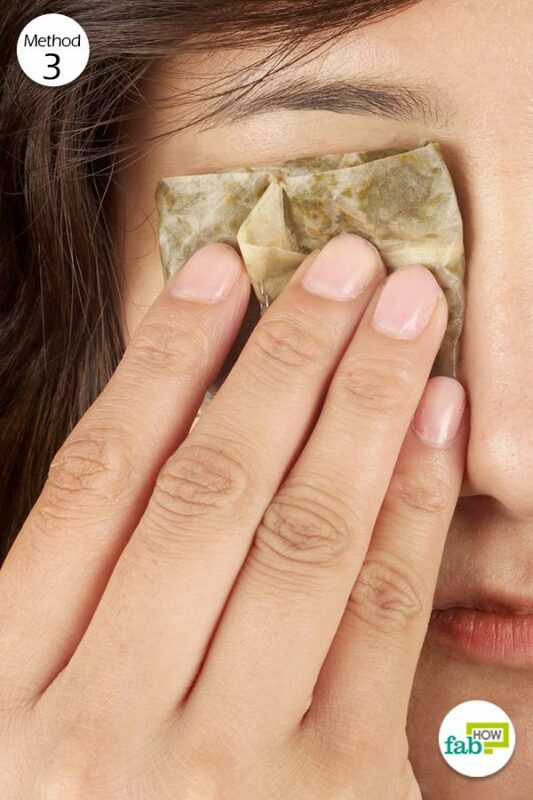 Place the tea bags over your eyes for 5 to 10 minutes. Repeat 2 or 3 times a day for 1 to 2 days for the symptoms to subside completely. The redness and swelling should go down just after a couple of uses. 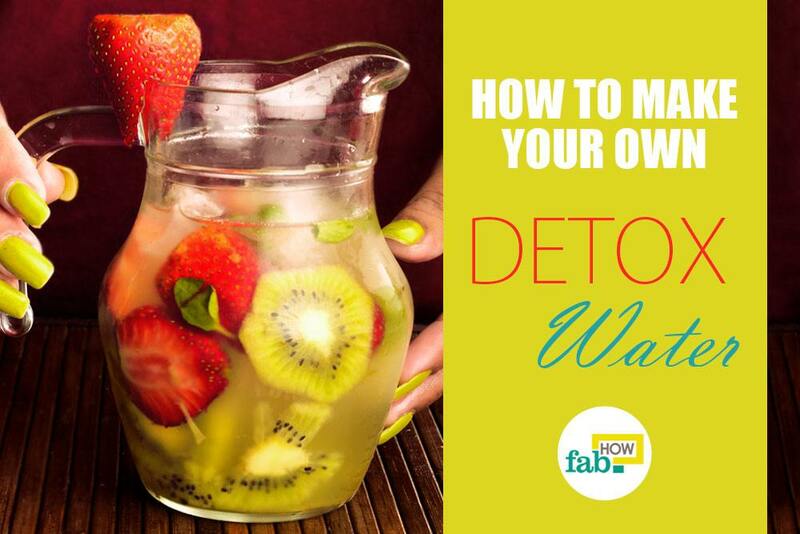 You can also prepare an eyewash by boiling 2 green tea bags in 1 cup of distilled water. Once cooled, use it to rinse your eyes twice a day. This sweet and crunchy slice of summer is also effective in soothing irritated eyes. Apart from their cooling properties, cucumbers are also rich in antioxidants that help reduce inflammation and swelling. 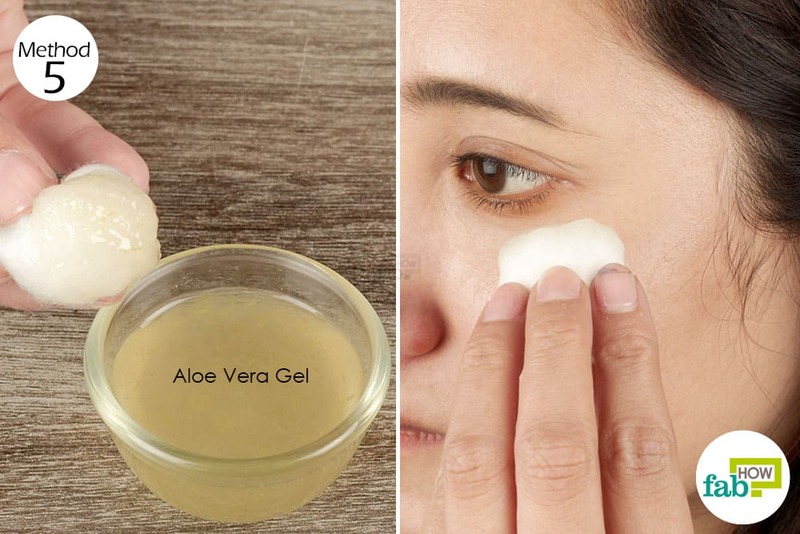 This cool remedy also comes in handy as a treatment for under-eye bags (5) and dark circles under the eyes. Refrigerate the slices for 10 to 15 minutes. Place a slice on each eye for 5 to 10 minutes. You can also replace the slices with fresh ones once they become warm. Repeat 4 or 5 times a day for 2 to 3 days to reduce itching and redness. You should notice improvement with just a few applications. Dip cotton balls in fresh aloe vera juice. Apply the juice-soaked cotton balls over your eyes. Wash it off with water after 15 to 20 minutes. Apply them twice daily for 3 to 4 days to alleviate the itching in the eyes. You can also swab the oil under the eyes to get rid of dark circles and on your lashes to make them thicker. 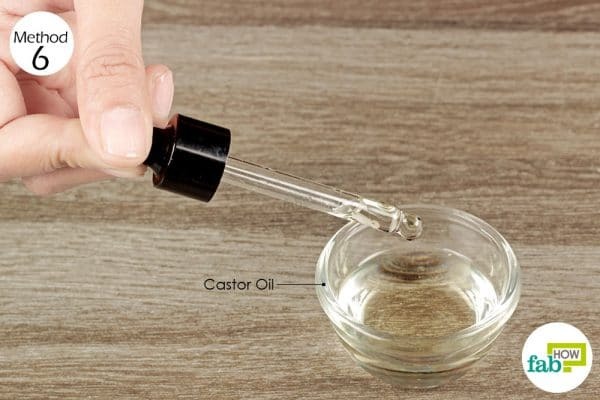 Lie down and put 1 drop of castor oil in each eye using an eye dropper. Repeat 1 or 2 times a day to get rid of itchy eyes within 2 to 3 days. Placing cotton balls soaked in rose water over your eyes can relieve itching in 5 minutes. Placing potato slices over your eyes for 10 to 15 minutes helps reduce swelling. Over-the-counter antihistamines can help relieve allergy symptoms. Give your eyes proper rest by following the 20-20-20 rule. After every 20 minutes, take a break from your work and look at an object 20 feet away for 20 seconds. This will help prevent eye fatigue. Rathi VM, Murthy SI. Allergic conjunctivitis. Community eye health. https://www.ncbi.nlm.nih.gov/pmc/articles/PMC5968423/. Published 2017. Carr W, Schaeffer J, Donnenfeld E. Treating allergic conjunctivitis: A once-daily medication that provides 24-hour symptom relief. Allergy & rhinology (Providence, R.I.). https://www.ncbi.nlm.nih.gov/pmc/articles/PMC5010431/. Published 2016. Diego JL, Bidikov L, Pedler MG, et al. Effect of human milk as a treatment for dry eye syndrome in a mouse model. Molecular vision. https://www.ncbi.nlm.nih.gov/pmc/articles/PMC5017541/. Published September 9, 2016. Nejabat M, Reza SA, Zadmehr M, Yasemi M, Sobhani Z. Efficacy of Green Tea Extract for Treatment of Dry Eye and Meibomian Gland Dysfunction; A Double-blind Randomized Controlled Clinical Trial Study. Journal of clinical and diagnostic research : JCDR. https://www.ncbi.nlm.nih.gov/pmc/articles/PMC5376801/. Published February 2017. Woźniak A, Paduch R. Aloe vera extract activity on human corneal cells. Pharmaceutical biology. https://www.ncbi.nlm.nih.gov/pubmed/22338121. Published February 2012. Garrigue J-S, Amrane M, Faure M-O, Holopainen JM, Tong L. Relevance of Lipid-Based Products in the Management of Dry Eye Disease. Journal of ocular pharmacology and therapeutics : the official journal of the Association for Ocular Pharmacology and Therapeutics. https://www.ncbi.nlm.nih.gov/pmc/articles/PMC5655476/. Published November 1, 2017.